Getting Backblaze up and running is easy, and is actually easier than CrashPlan was. There are fewer options, so you really do just install it, and let it get on with it (its one mode is “upload all of my data”). Visit the Backblaze website, type in your email address, and choose a password. 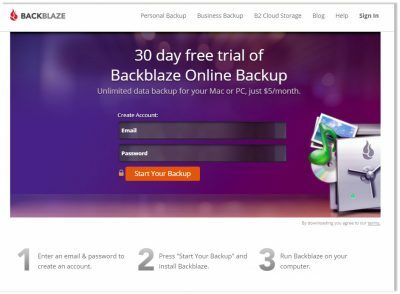 As Backblaze manages your data restore (ie, getting things back from your backup) via their website, your password is important: first you don’t want to forget it, but second, you need to be sure nobody else knows it – else they could restore your copies of your data! You can use this page to make up a new password. Click the Start your backup button. You’ll be given a special installer program to download and run: it’s connected directly to your account. You just need to run it on each PC that you’d like to back up. 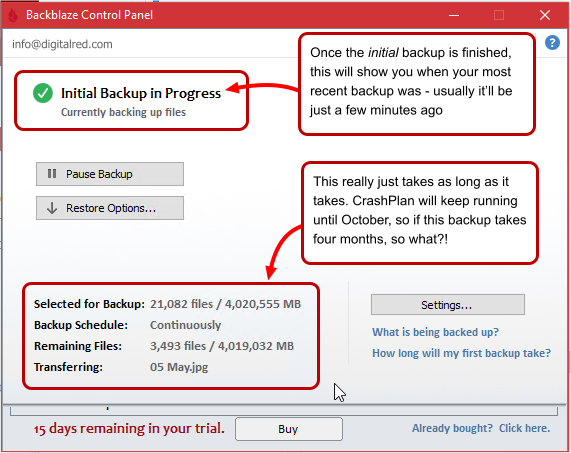 The next step could take 5-10 minutes, depending on the amount of data that you have, but you’ll see an initial estimate of how much stuff Backblaze has found to backup. It doesn’t matter how much it finds: it won’t cost any more to backup loads of data – and it’ll backup all of your data. The regular Backblaze program window is nice and simple. It doesn’t need to show very much: only how much data you’ve got that needs backing up, and how much of it is done. If everything is done, when was it last updated? Once you’ve got to this screen, you’re basically finished. Just leave it for a few days and see how far through the upload it has got. From that, you’ll be able to work out how long the complete upload will take. Whenever you save a new file or change an existing one, Backblaze backs it up straight away. You’d be able to restore any earlier version of any file from the last 30 days at any time – and from any PC. 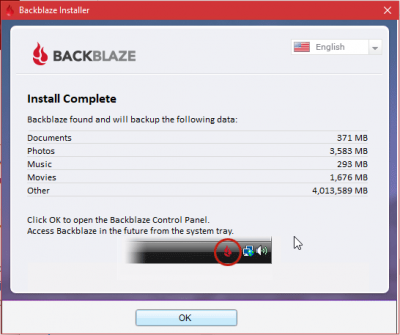 You can probably install Backblaze yourself with the simple steps above, but if you’d like help to do it and check that it’s working, I am of course happy to give you a hand. Give me a call on 020 3411 4445 and we’ll take a look. I don’t need to visit you, and can help via remote control. There’s no harm in having both CrashPlan AND Backblaze installed on your PC. In its free guise, CrashPlan only runs once per day anyway (Backblaze runs, and backs up, all the time). If your initial Backblaze data upload takes 2-3 weeks, you definitely want to keep CrashPlan running during that time so that you have at least one complete backup. Once Backblaze has been running for a while and has finished its backup, you can uninstall CrashPlan. 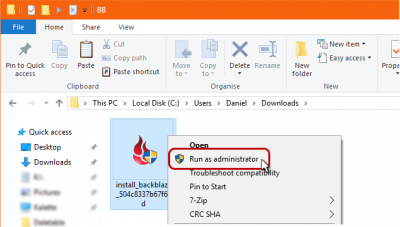 Let me know when you do that if you have been backing up to my PC, and I will delete the encrypted archive of data held on the drive on my PC. If you don’t do anything with CrashPlan, it’ll stop working (but the program will keep running on your PC) in October when Code42 turn off their CrashPlan Home service. 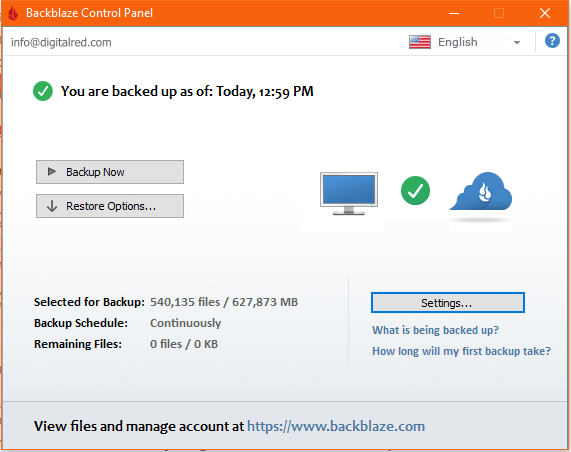 I have been using Backblaze since just before Christmas, and have been using it exclusively for the offsite backup of the PCs in my office for the last few months. I have tried restoring files and have kept an eye on the backup status in that time – I have been very happy with it. I’m confident enough in it to recommend it for CrashPlan refugees. I have been making and taking local backups too – in other words, I have been making backups on external hard drives on my PCs. That’s very much a manual process, even when the backups run automatically, because the drives need to be changed over. 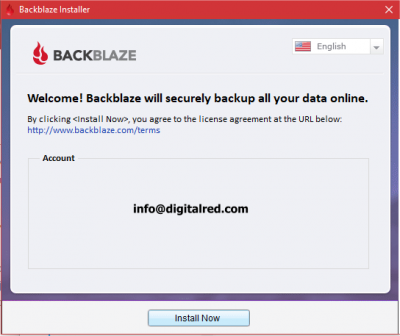 You might use a similar process as well as Backblaze, but I really recommend against doing it instead because you’ll forget to change discs over, or something won’t work, and you’ll end up unprotected. I’ve seen too many people lose data, having thought that they were taking a backup. It’s something that is very easy to do badly, and quite difficult to do properly. You can follow the steps above (the first set of numbered points, above: the text with all the screenshots) if you’d like to install it yourself. If you prefer me to handle the installation and make sure that it’s running OK, you can call me on 020 3411 4445 and I will take care of it. The installer says that it’ll work on a 14-day trial, but once the program actually installs, that will update to a 30-day trial. You’ll get a couple of emails from Backblaze themselves after you install and they’ll prompt toy to log in and give some payment details so that you can convert from the free trial to the paid-for subscription. The subscription is $5 per PC per month, or $50 per PC per year. Especially with foreign currency transaction charges every time, it’s much cheaper to do it annually – after 20% VAT is added, you’ll be paying £40-45 per PC.